“I just started last week. I don’t have a license yet but everything seems to be going okay. 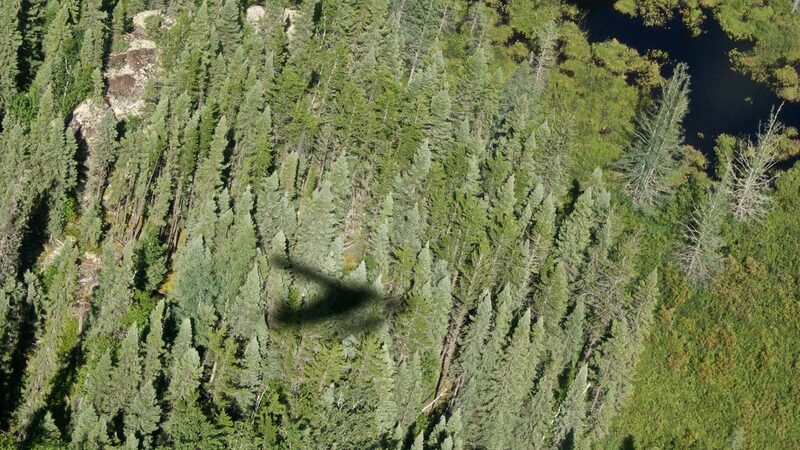 I haven’t even come close to crashing.” That was Brian our pilot talking as he taxied the de Havilland Beaver down Mattice Lake for take-off. He had answered my typical “You been doing this very long?” with a straight face that had us for just a second or two. Chuckles at the joke and then the headphones went on and we were off to Rockcliff Lake, near the start of the Misehkow River system. 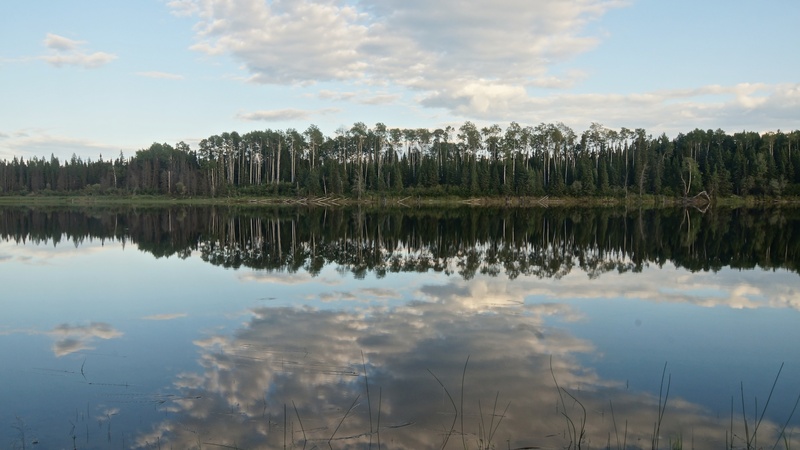 It was the put-in point for our planned nineteen-day paddle around the northern perimeter of Wabakimi Provincial Park in northwestern Ontario, a little-visited canoeists’ destination the size of Prince Edward Island. The Google map above shows the key points of our route. We had a 350-kilometer adventure ahead of us and it would begin with almost the entire length of the Misehkow right to where it joins the Albany River. We would then paddle another eighty kilometers down the Albany to Petawanga Lake before turning south and upriver, taking on Petawa Creek and paddling up the Witchwood and Raymond Rivers before crossing the Height of Land and going downriver on the Pikitigushi as it flows from Butland Lake through Cliff Lake and on towards Lake Nipigon. We had allocated nineteen days to “git ‘er dun”; time would tell if we were wildly optimistic in our calculations! 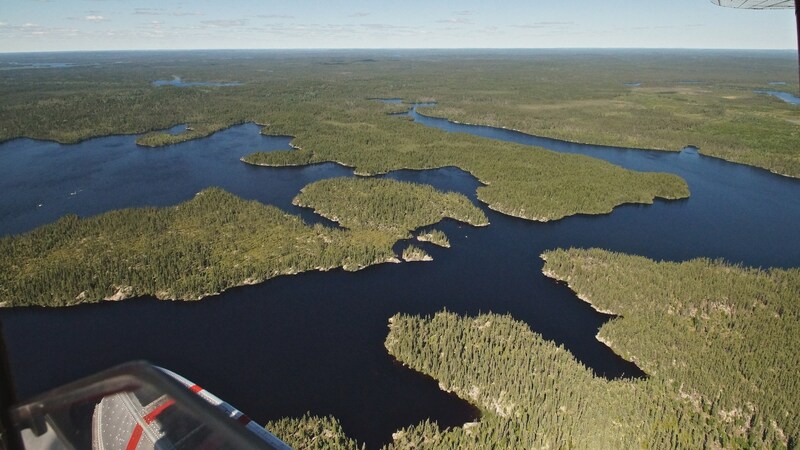 On our three previous visits to the Wabakimi area, we had made use of the VIA rail service to access various put-in points (Allanwater Bridge and Flindt Landing) and we could have done the same for this trip. 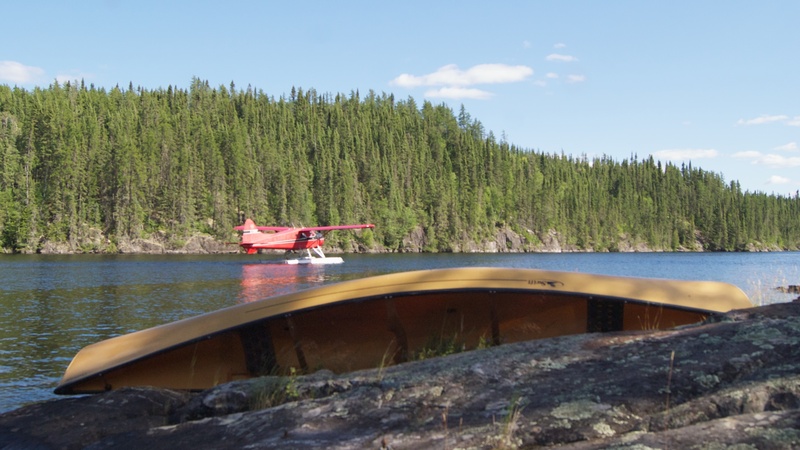 It is just that, having already paddled the waters north from the CN tracks up towards Burntrock Lake, we thought we’d skip the one-week paddle north from the rail line to Rockcliff Lake. The solution: splurge and take a forty-five-minute flight from Mattice Lake to the start of the Misehkow. A Cheaper Alternative – but at the cost of an extra week! Another account of a trip that includes the Misehkow – the one that gave us the idea to take on what definitely sounded like a challenge – can be accessed here. Chuck Ryan (aka CIIcanoe) and his partner Dave Phillips flew into Pashkokogan Lake, which lies just west of Greenbush Lake, and then spent two days paddling and portaging their way east to Rockcliff Lake. Except for these first two days, we redid their route. What we were hoping not to relive was their gruelling experience thanks to the high water level and bad weather cards they were dealt. 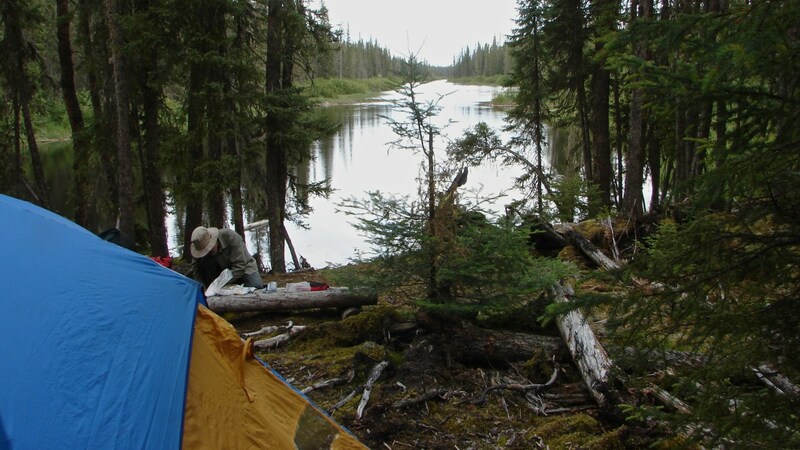 After doing the route described in CIIcanoe’s series of posts you’d end up in Armstrong after a shuttle from the take-out point on the Pikitigushi River close to the logging road and right by The Boucher Bros. Bear Camp. 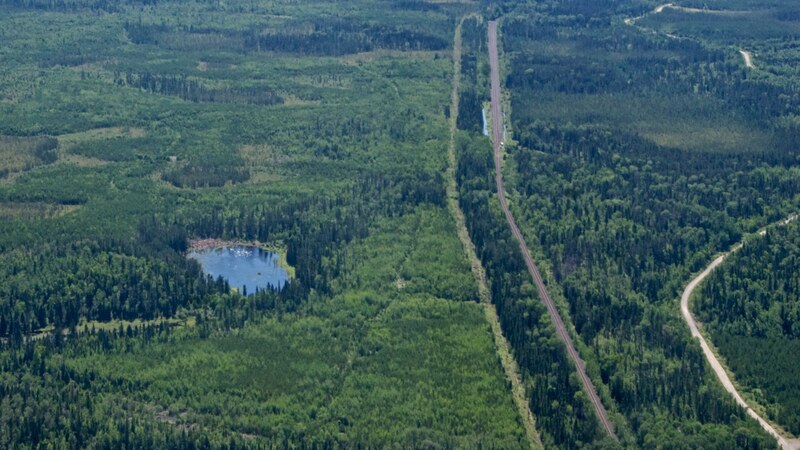 At Armstrong Station, you’d catch the VIA train west back to Savant Lake and your vehicle. The VIA train comes through three times a week so you would maybe have to spend some extra time in Armstrong before getting back to your car and the drive home. Given all the shuttles and inconvenience it might be cheaper to fly in! Either that or just drive up to Armstrong Station and take the VIA train to Savant Lake to your pre-arranged shuttle up Highway 599. That way your vehicle would be in Armstrong when you finished the route. 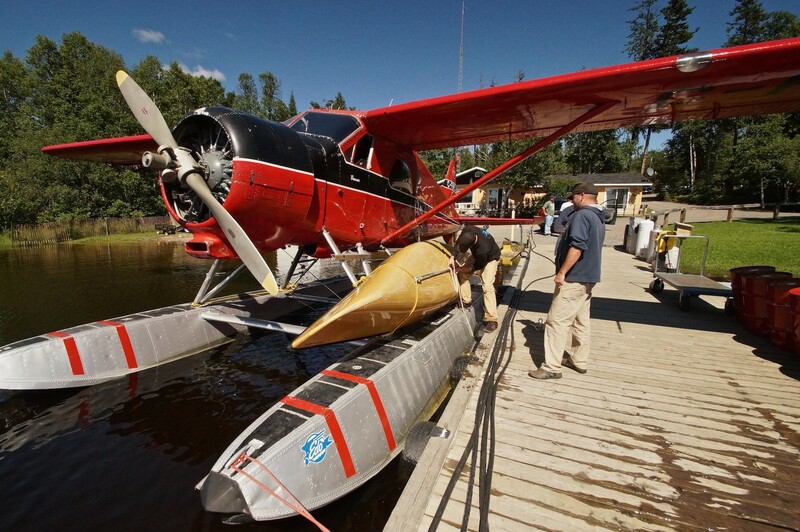 As well as providing de Havilland Beaver and Otter fly-ins, Mattice Lake Outfitters provides shuttle service and a safe place to leave your car for two or three weeks. We got to Rockcliff Lake at 5 in the afternoon after a forty-five-minute flight that is definitely worth doing at least once. (Two more paddlers on board would have almost halved the cost and made it even better!) We had Brian land by the outpost on the west side of the lake about three kilometers from the south end. …you will land in a canyon-style lake surrounded by mountainous cliffs and trickling waterfalls. There you will find a cozy log cabin and three boats fully equipped and ready to go! Well, it isn’t quite like that! Rockcliff Lake is hardly as dramatic as this promotional copy makes it sound. We checked out the outpost itself – it hasn’t been used for the past three or four years and the screen door and the grounds need some attention, as does the dock that we had our pilot park next to. After unloading our gear from the Beaver, and scouting for a potential campsite, we paddled towards the south end of the lake to check out other campsite possibilities. 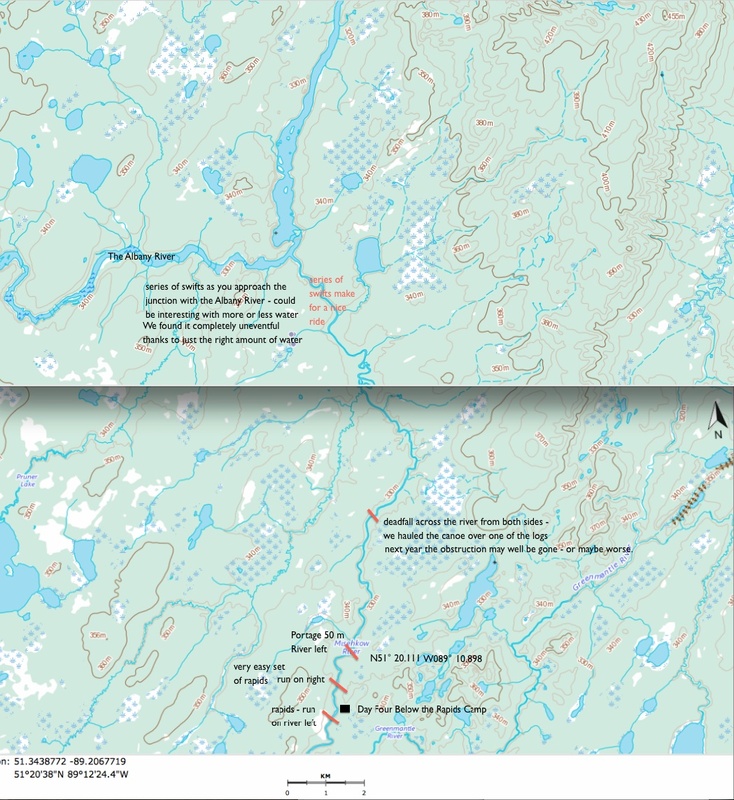 One of our maps indicated a site on the west side of the lake facing a small island. After having spent the past day and a half driving up from Toronto, we were rewarded with the solitude of this beautiful northern lake. However, not really seeing anything that said “campsite”, we turned back to the outpost and claimed the flat spot by the picnic table for the night. It was so quiet that we could hear the sound of a small stream trickling into the lake on the other side. Later a couple of loons would provide us with the night’s entertainment. It felt great to be back in Wabakimi country and we were keen to get started the next morning. We had agreed on the route way back in March; now we’d finally get to do it. Portages: 4 – an easy 70-meter one, an unexpected one around a set of ledge rapids, and a couple of difficult-to-find longer ones. See below for more detail and map info. We zipped through lots of swifts and down some very easy sets of rapids. Your water level may make for a different experience. As always, take a look yourself before you go – no matter what the maps (or this post!) say! We were up at seven on a sunny morning and on the water by nine. Our planned goal for the day was the north end of Rockcliff Lake, a very easy first day. We were there at 10:30 with a slight SW wind on our backs and decided it was way too early to be calling it a day! As we left the lake and entered the narrower section of the Misehkow we looked for a campsite marked near an apparent set of rapids. 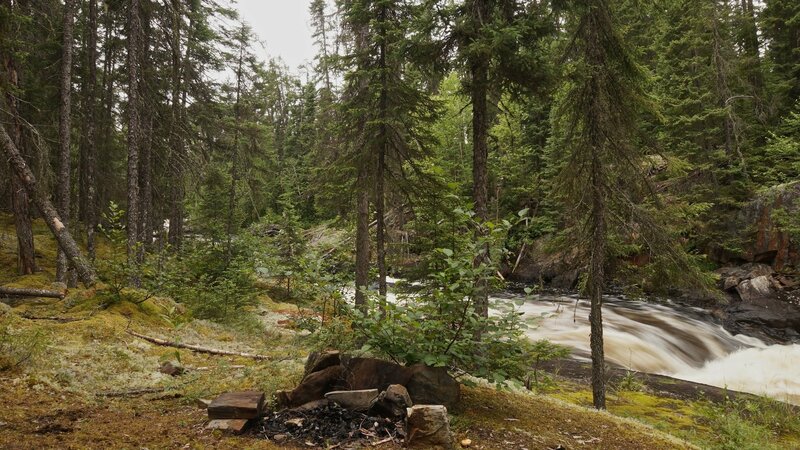 While we didn’t see the campsite, we did find a few sets of Class 0 rapids and swifts that took us down to our first portage of the trip – an easy-to-find 70-meter portage on river right. 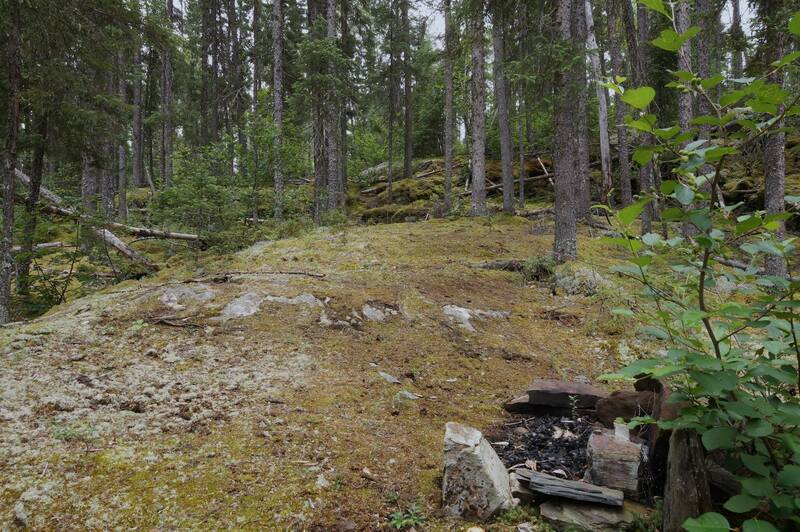 Before we got to the portage we did note a potential campsite – serviceable even if not great. It was shortly before noon when we slipped our loaded canoe back in the water after our first portage. We decided we would stop as soon as we found a decent spot. It has to be said that the Misehkow is not blessed with a lot of great campsites or even inviting places to stop for a lunch break! What it does have lots of is moose! 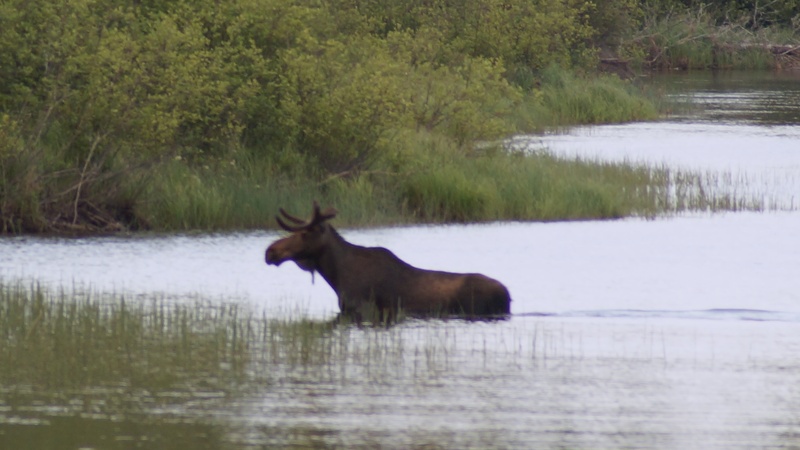 We saw one on this stretch of the river, the first of a half-dozen we’d see during our time paddling down to the Albany; the frequent bends in the river and its wetlands quality – lots of grasses, reeds, and water lilies – makes it great moose country. 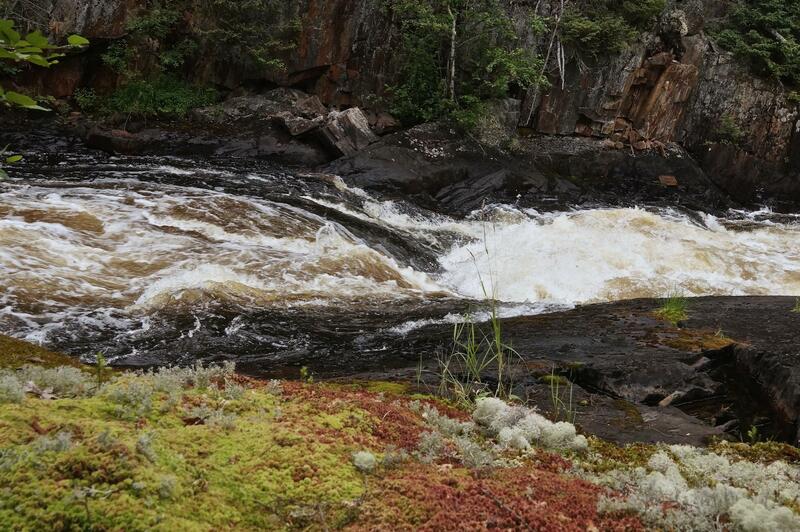 It reminded us a bit of the area around Peterbell on the Missinaibi where we have also seen moose on occasion. Lunch over just before 2, we set off for Iron Falls, having decided that it was still too early to call it a day and figuring we’d get to the Iron Falls campsite by 5:30 at the latest. Well, as the poet says – “the best-laid plans of mice and men…”. 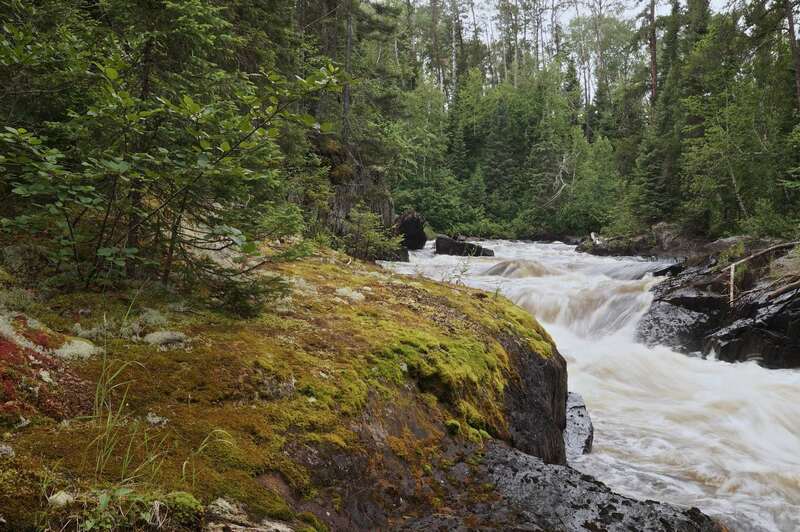 We were to have a very late supper at Iron Falls – it was about 9:30 – after having to deal with the consequences of conflicting info on upcoming rapids and portage trails, two of which required a bit of bushwhacking just to stumble onto. We didn’t know it then but Day 1 – of all days! – would be the longest both in terms of distance travelled and time spent. The first big challenge came very soon after we left the lunch spot. We had a fun time finding the portage trailhead and were looking for a short 70-meter portage across the nose. After thirty minutes of bushwhacking, Max found himself on a section of the portage trail, which he followed back to the take-out point, about 50 meters up from where we had beached the canoe. 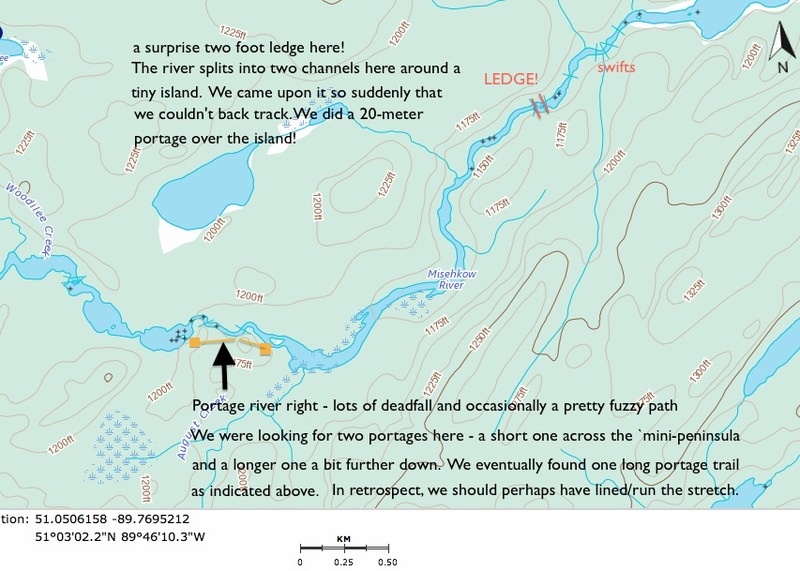 It turns out that the short portage doesn’t exist; what is there is an overgrown long portage on river right that takes you past both sets of rapids. We regretted not having our orange marking tape along to leave a visible clue to save the next group of paddlers some time and energy. Deadfall covered sections of the trail, which often disappeared for stretches at a time. Had we known how much energy we would be putting out on this portage, we would have stayed on the river and lined/run it. By four we were at the put-in spot, having spent almost two hours to find and complete a portage that felt twice as long as the stated 400 meters. A couple of kilometers further down we were surprised by a two-foot ledge drop and ended up on the small island which divides the river into two channels. Since lining was not an option, we spent twenty minutes on a 20-meter impromptu portage across the island and continued on our way, wondering by now what other unexpected challenges we would be presented with. What we got was a couple of hours of uneventful paddling until we got close to our goal for the day. 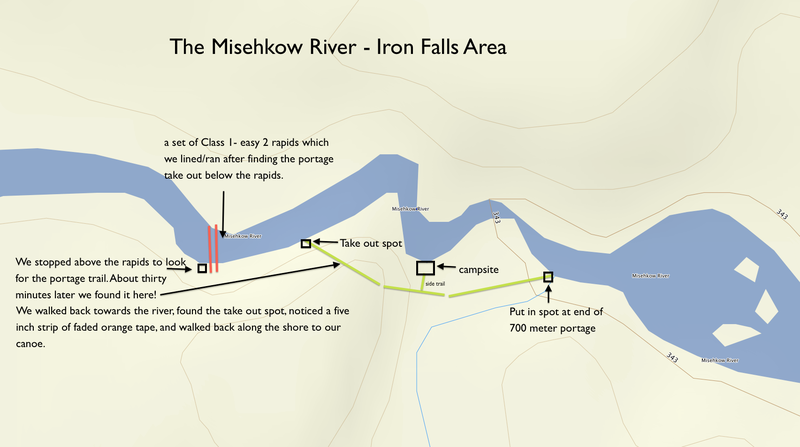 Since Iron Falls is the single most turbulent stretch of the Misehkow, we figured that the portage take-out would be pretty obvious and maybe even marked, given the consequences of missing it. We knew that the portage was on river right and that it was about 800 meters long. This much was true. What we didn’t know was that the portage trail begins below the first set of rapids. Pulling in above these rapids, we switched into bushwhacking mode for the second time that day. It took us a half-hour to find the trail and work our way back to the take-out point. We stood there and looked up the rapids to where our canoe was; well, at least this trail was in better shape. We lined/ran the canoe down the rapids and pulled into the take-out spot. The short piece of faded orange marking tape tied to a branch needs to be refreshed! 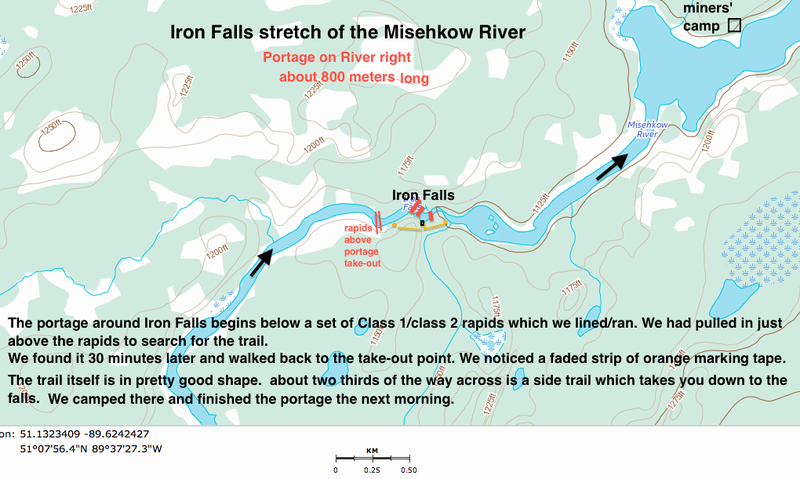 a detailed look at the Iron Falls area on the Misehkow – the portage is on River Right! 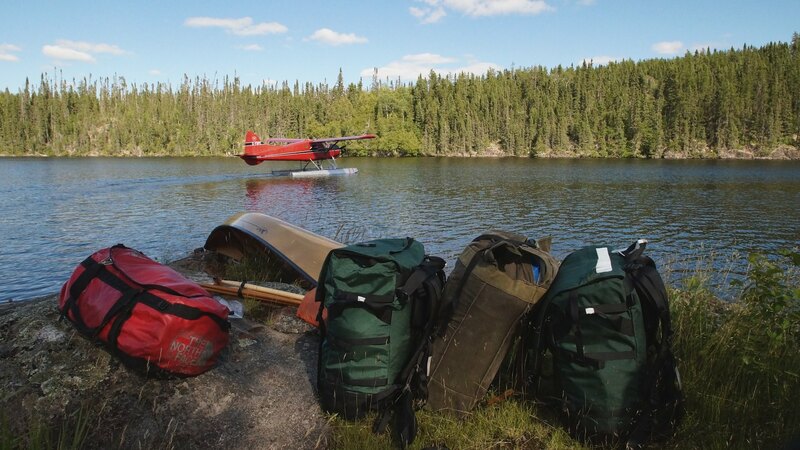 We hoisted the packs and canoe one more time that day and started the portage. By 9 the tent was up and by 9:30 we were having a late supper by the fire pit at the side of the falls. We had chosen to camp on the trail some distance above the area by the falls, not finding a spot flat enough down there for a four-person tent and not really big fans of the never-ending flushing sound that a set of falls provides. Sometimes we just don’t know when to stop. Day Two was one of those days. We should have called it a day at the lunch spot but did not imagine that finding a decent campsite before Iron Falls would be that much of a challenge. So here we were at Iron Falls! We treated ourselves to a late start on Day Three – we set off at 10 – and would add to that by stopping for an early lunch on top of a beaver lodge – the only place we could find on what I have already described as a river lacking in inviting rest stop points. After lunch, we paddled for another hour and when we passed a great-looking campsite at 2:00 we knew enough to pull in. Three hours of paddling and the day was done! After the tent was up we actually had a two-hour nap before getting on with things. Supper was a Harvest Foodworks pouch supplemented with some extra rice. 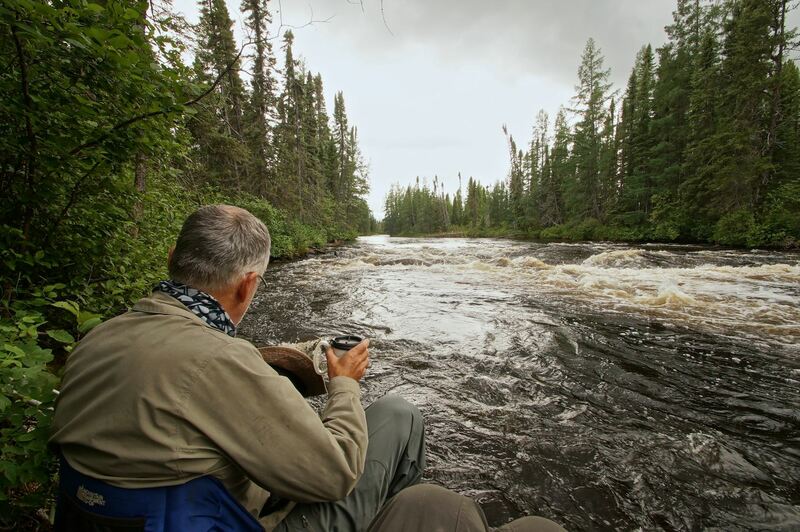 We sat there on the log by the fire pit looking down the river – a quintessential boreal forest scene. 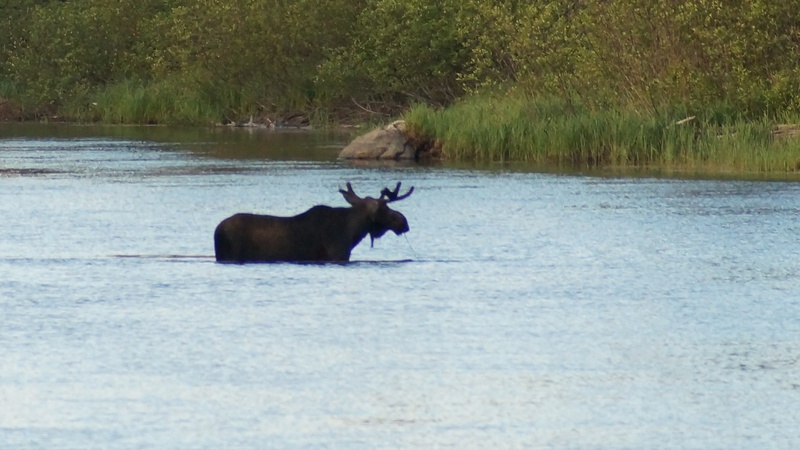 Shortly after eight, a bull moose strolled into the section of river we were contemplating; he would spend the next ten minutes wading and munching – and occasionally looking our way. A few minutes later the calf walked into the river towards the bull. Here we were three days into our trip and we had already seen more moose than on any other route we had done. Watching them – seemingly awkward and clumsy but really having the grace of ballet dancers as they eventually disappeared in the bush – is always a special moment. the end of the show – heading for the exit! We had our first hard rain during the night and it went on for a bit but by the time we got up – around 7:00 – it had stopped, making the camp take-down routine much more pleasant. By 8:45 we were on the water, unsure about what the day would provide in the way of entertainment. First up would be yet another moose sighting! Always great to paddle into a fellow vegetarian! We did make a point this morning of checking out potential campsites, thinking about paddlers needing to get off the water in a hurry and looking for something serviceable, even if not the greatest. 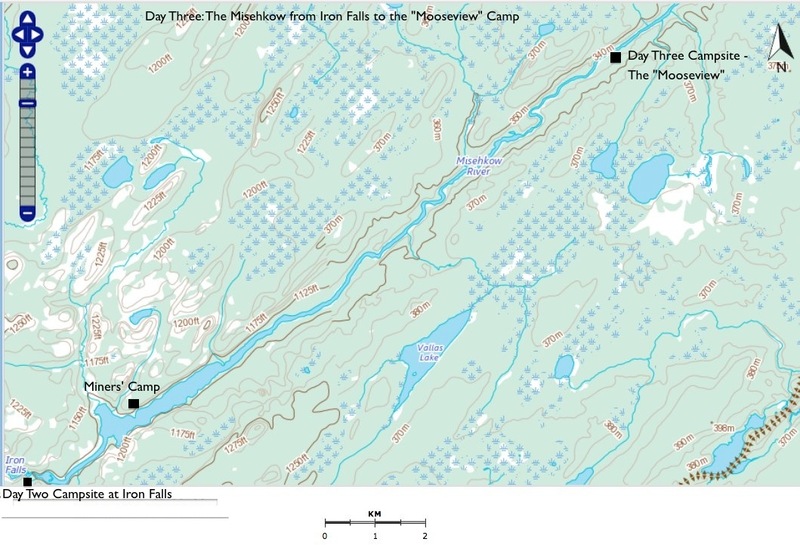 The above map shows three such sites – a couple of them had fire pits already. We also dealt with four sets of rapids. The first one has a ledge with a two-foot drop; we lined and ran it. The second set came soon afterwards and was an easy Class 1 set that we just ran. The campsite below this second set has room for a couple of tents and has a fire pit. About eight kilometers further downriver was the third noteworthy set, which we lined and ran to the sound of distant thunder. This provided us with the motivation to think about ending the day a bit early – we hadn’t even had lunch yet, having planned to have it at the bottom of this set of rapids. Instead, we went on and within thirty minutes came upon the fourth set of rapids for the day, an easy run on river left, and then amazingly a campsite below the rapids on river right. We were done for the day, all in all, a pretty easy one. 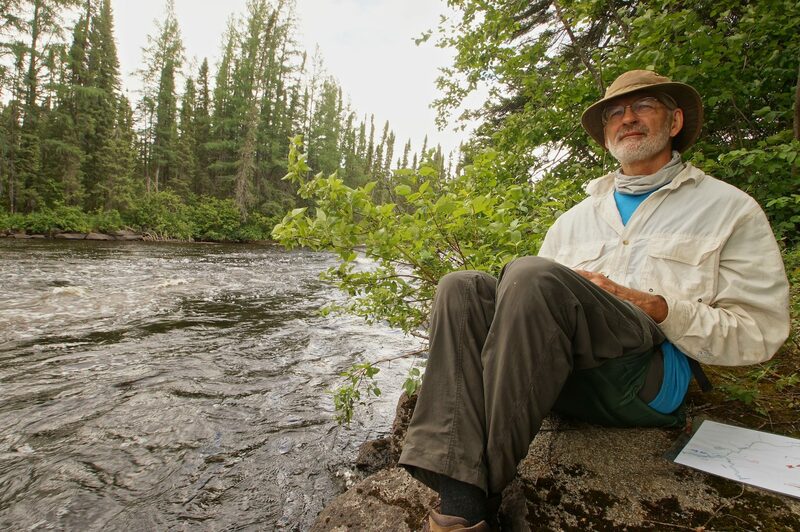 at OM on the Misehkow – my idea of a meditation center – Day 4 camp on the Misehkow by the day’s fourth set of rapids – with a MEC Senate seat you’re at home anywhere! my young bro – he’s not even sixty yet! – on the banks of the Misehkow at the end of Day 4 – the ultra wide angle is not a portrait lens! This day would be our last on the Misehkow. 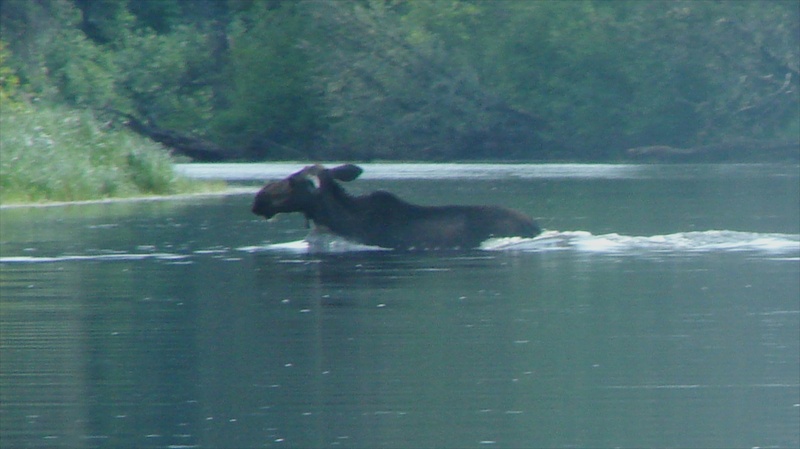 We had enjoyed the paddle down a seldom-experienced river and been treated to a half-dozen moose sightings. Fuzzy info on rapids and portages was complicated by some difficult-to-find, overgrown and deadfall-strewn portage trails themselves. It made us realize how much we rely on the reconnaissance provided by others. Shortly after leaving the campsite we came upon a Class 1 set of rapids which we slipped down very quickly. A more complicated set of rapids came up a few minutes later. 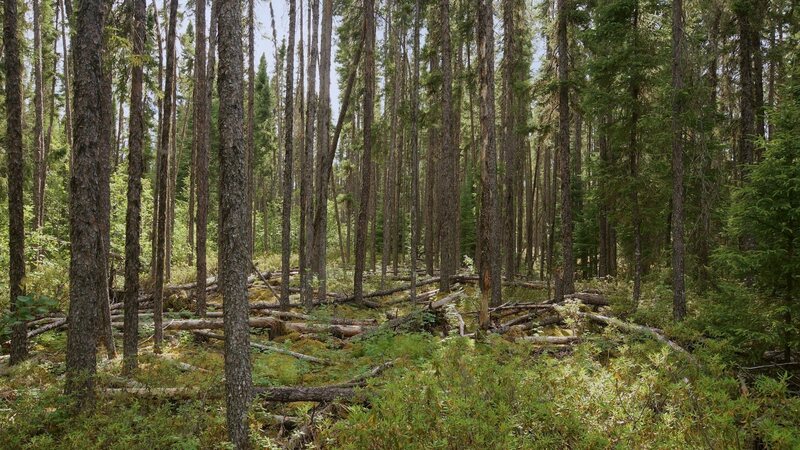 We found the overgrown portage trail on river left just above the first set of ripples and, stepping over the deadfall, were soon at the put-in point some fifty meters downriver. 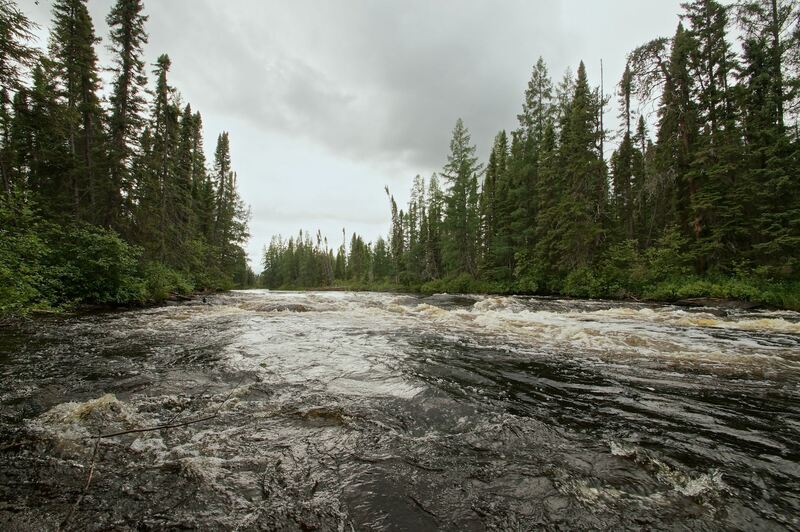 Other than that, there was little to deal with except for the deadfall and sweepers crossing the river from both sides a couple of kilometers downriver from the portage. Finally, we approached with some anticipation/trepidation the “rapids” at the end of the Misehkow as it tumbles into the Albany but they turned out to be an easy-to-do series of swifts which provided us with a great ride and little more. Mind you, a little less water and you’d have a deluxe boulder garden to weave your way through – and a little more water might add to the turbulence we were expecting. We got to the junction of the Misehkow with the once-mighty Albany at noon, about 3 hours after having left our campsite. (I would love to have seen the historic Albany River before the series of water diversions beginning in the 1940’s severely reduced the volume of water.) We paddled down a short way, had lunch on the banks of the river, and then went on another eight kilometres or so before we stopped for the day at 3:30 opposite the view you see below. Petawa Creek Takes Its Toll – We leave behind a camera and a paddle! I should explain here my lack of decent pix to illustrate the events and scenery of each day’s paddle! I usually create my posts by choosing the pix and then writing the text. Some eight days into the trip, after having spent a challenging day going up Petawa Creek, the camera I used for day-time shooting – and more importantly, about 250 pix that showed the various aspects of each day’s progress – popped unnoticed out of my shirt pocket. The moment I realized that it was indeed gone was the most depressing moment of the trip for me. I had some neat shots! I now realize that my $100. daytime p&s gets to take all the interesting shots while my super-duper DSLR with the Zeiss lens only gets taken out of its waterproof container at the end of the day after the tent goes up. Unfortunately for it there is often nothing really compelling near the campsite to turn into a photo. Re: depressing moments. I should also mention that my brother’s moment had come a couple of hours earlier than mine as his 25-year-old Auggie Lolk paddle fell into a particularly fast-moving stretch of rapids on the very same Petawa Creek. If you do choose this as your next adventure, keep an eye out for his paddle as you’re going up (or down) the creek! 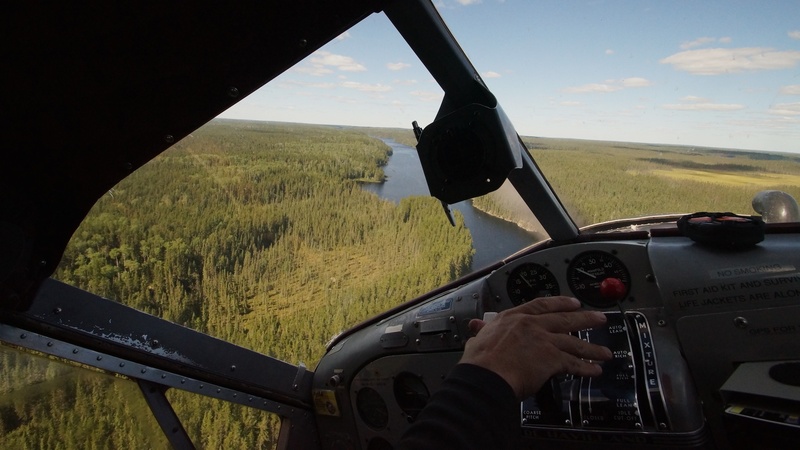 You can read about the challenging day we spent on Petawa Creek in this post – just click on the title Up Wabakimi’s Petawa Creek Without A Paddle. When we planned the trip we were happy to note that of the 16 km of portages (and therefore, 32 kilometres or so of actual trail walking), only six were in the first nine days, the downriver portion of the trip. Given that we started off with about 75 lbs. of food, it meant that by the time we got to the serious portaging (the portage from the Witchwood River to Whiteclay Lake), we would be about 50 pounds lighter. 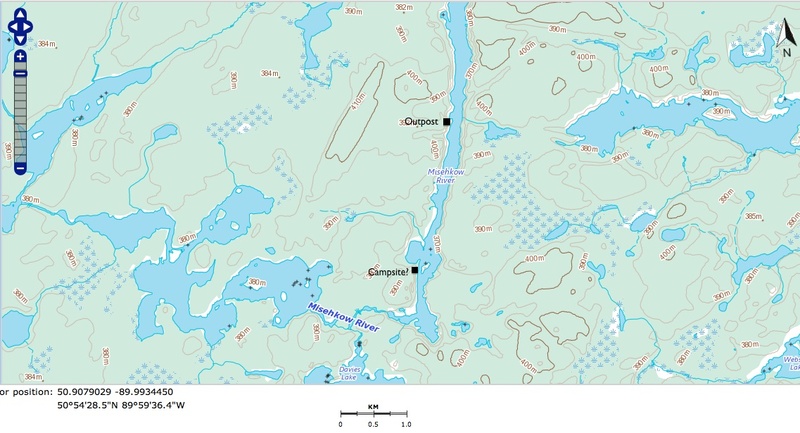 For some good info on canoe routes that would get you to the Misehkow from somewhere along the CN tracks from Savant Lake in the west to Armstrong in the east, start with a visit to the Friends of Wabakimi site. 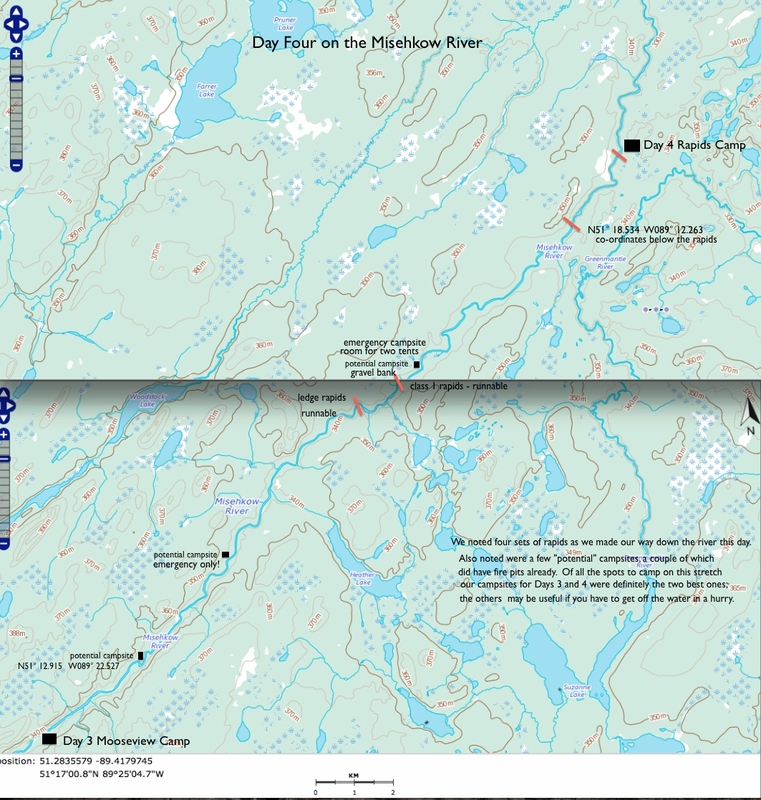 There are currently four volumes of canoe route maps available. Click here for a look at Volume One, which provides the essential route info you would need to get from Armstrong (after a short shuttle) all the way to the Misehkow. Volume Two (here) would be the one you would want for route info on an approach from Savant Lake or a put-in somewhere along Highway 599. 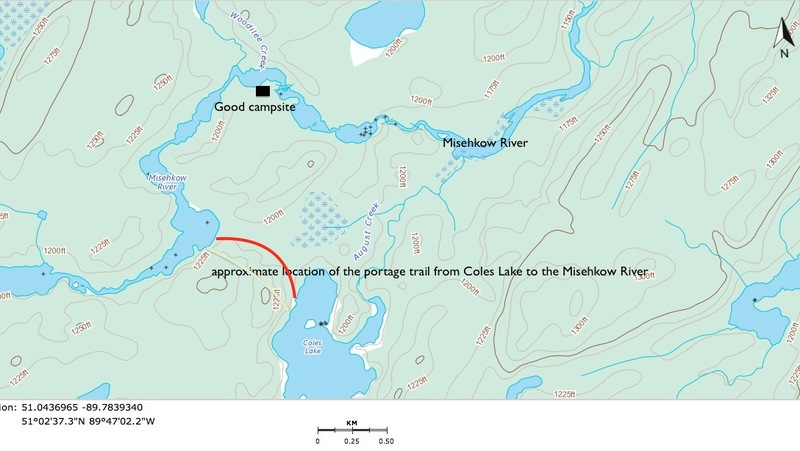 It also has route info on the Misehkow as far up as the Coles Lake area. Volume Three (here) provides yet more possible routes to get you from the CN tracks to Wabakimi Lake, after which you’d make use of the Volume One route info to complete the trip to the Misehkow. www.myccr.com forum contributor Voyageur makes what must have been one of his first-ever posts with a question on the Misehkow. Fellow posters provide all sorts of interesting comments and suggestions. Worth reading even though it goes back to 2003! Check the thread out here. As mentioned above, the Chuck Ryan posts on the trip he and Dave Phillips did back in 2009 were the inspiration for our route. We ran off a copy of the day-by-day descriptions and were able to finish most days thankful that we did not have the same high-water, bad-weather conditions they did. You can find the posts here. 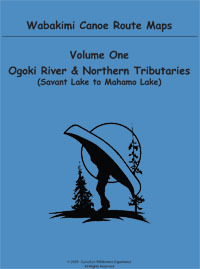 The Canoeing Ontario’s Rivers book I mentioned at the beginning is worth looking for. 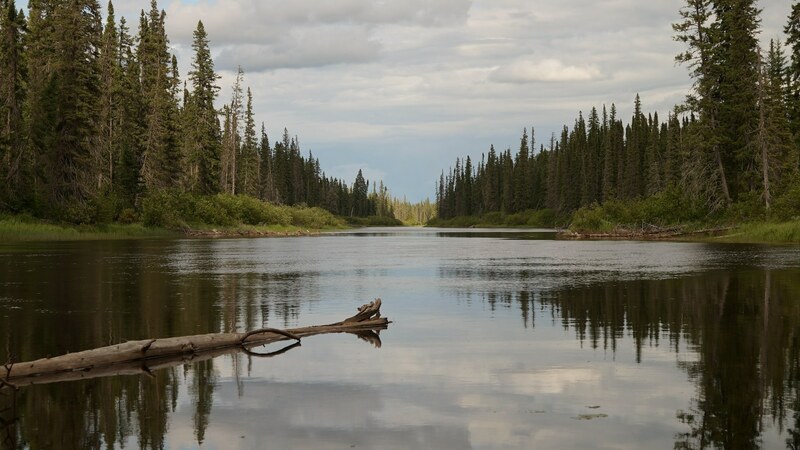 The writers provide excellent natural history background and outline a three-week canoe trip that would take you from the CN tracks near Collins all the way to Fort Hope via the Misehkow. Toronto residents with a public library card can click here to place a hold on one of the two copies in the system. You can also find a pdf file of the chapter here. So Where Are the Pictographs? 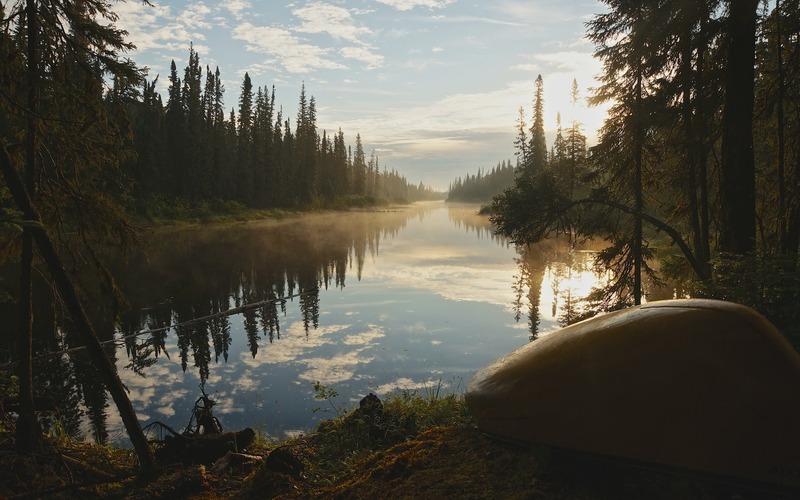 The Canoe Atlas of the Little North (click the title for more info) is the ultimate coffee table book for anyone interested in the canoe routes of the vast area from James Bay to the eastern shores of Lake Winnipeg. It has some info on the Misehkow, based on trips the authors themselves or other paddlers may have done. 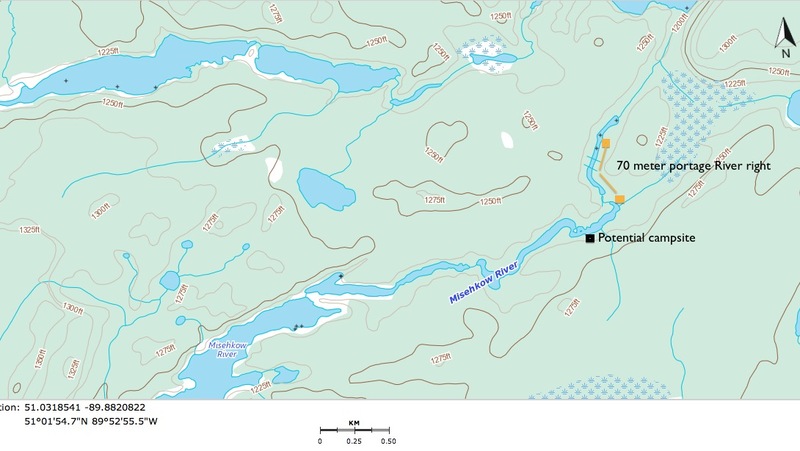 It also mentions a pictograph site on the Misehkow. Well, we may have seen a lot of moose on the Misehkow but pictographs – uh-uh! 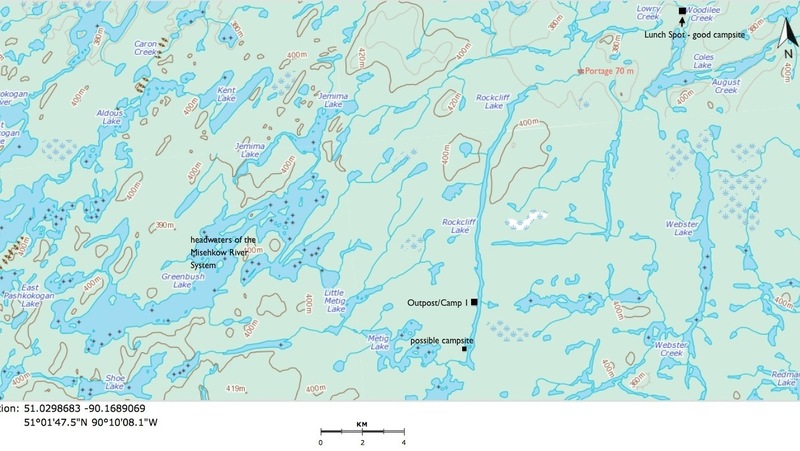 Given the nature of the river – mostly reed and grass-lined all the way down with very few vertical rock faces to be found – my guess is that the best location for a pictograph site is Rockcliff Lake, and even it is mostly lined with bush right down to the water line. The best of luck to future paddlers in their search! 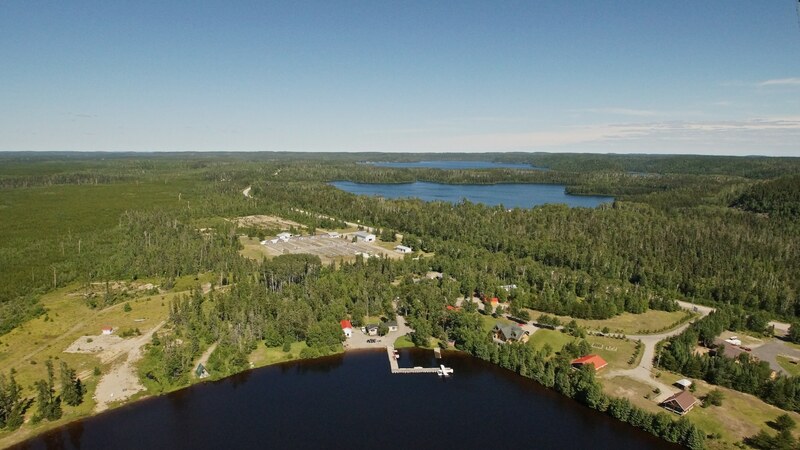 Given the scarcity of good campsites on the Misehkow River, what follows is our recommendation for a one-week sequence of campsites that will break your days into easy-to-manage chunks and avoid a day like our 41 km one to Iron Falls from Rockcliff Lake. If you’re into fishing you should have no problem filling out a week on the Misehkow. 2012 A Tale of Three Rivers – from Allanwater Bridge put-in up the Brightsand River system; then up the Kashishibog River system to Redsand Lake portage and down the Kopka River to Bukemiga Lake takeout. 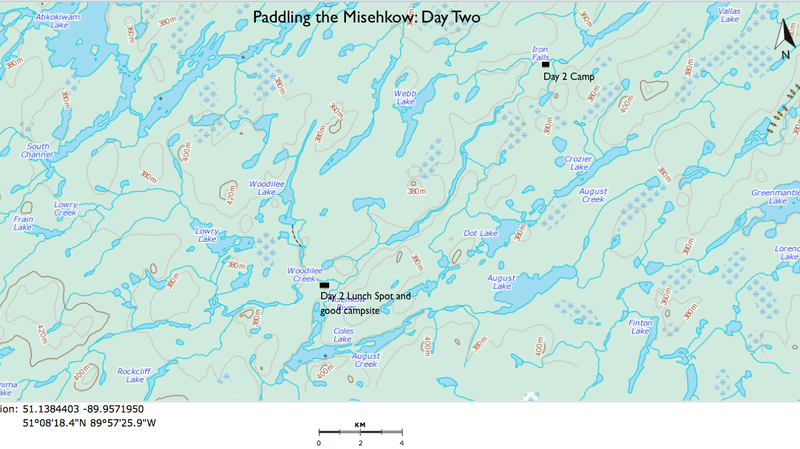 This entry was posted in wilderness canoe tripping and tagged Iron Falls portage, Misehkow Albany canoe, Misehkow camping spots, Misehkow river canoe trip, moose on the Misehkow, Rockcliff Lake. Bookmark the permalink. I really enjoyed all of the trip report ! “Uncle” Phil Cotton gave me the link to this site. I’m the Swiss paddler who thinks about doing a family trip from Highway 599 to the Misehkow River, then following down the Albany River to Fort Hope, next summer. I might be able to find out more about the pictograph. My friends in Sioux Lookout are living next door to Thomas Terry. Let’s see if he can give me some detailed information….. Thank you very much for posting! André, I’m glad to hear the post was of some use. The Misehkow is a seldom-travelled smaller river which we found to be quite beautiful, although campsites were few and far between. 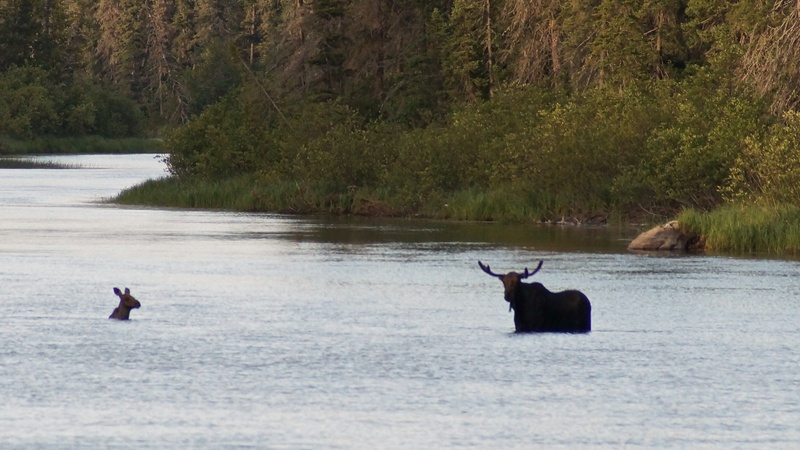 As you will have noticed from the pictures, we saw a number of moose as we paddled down. At the end of the post I did list a suggested itinerary based on the best campsites we found. I am wondering how old your children are – I imagine that you will have two canoes with one child in the bow of each canoe. Any time you have already spent with them canoeing and camping will be helpful. The biggest challenges we had on the river were the two long portages on Day One – we couldn’t locate either one! Hopefully my post has made clear how to find them and what they are like. It will take about seven to ten days to travel from Highway 599 to the point where the Misehkow meets the Albany and then another seven or ten to paddle to Fort Hope. I wish you all the best in your plans – and with the trip you do. There are slightly less ambitious routes that you could choose! But whatever you decide, this will be an epic trip that your children and you will share for the rest of your lives! And who knows – maybe you will see the pictographs!